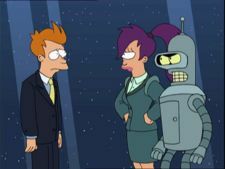 "Future Stock" is the fifty-third episode of Futurama, the twenty-first of the third production season and the ninth of the fourth broadcast season. It aired on 31 March, 2002, on Fox. Planet Express is taken over by That Guy, who improves the company's image, but he decides to sell it to Mom. 1.1 Act I: "Awesome! Awesome to the max!" 1.2 Act II: "I am proud to be the shepherd of this herd of sharks." 1.3 Act III: "My only regret is... that I have... boneitis." Act I: "Awesome! Awesome to the max!" Planet Express' stockholder meeting is taking place at the Lodgatorium Comfort Dome Inn, and Fry and Zoidberg get hungry and visit the Bot-Mizwah next door to get some free food, though Zoidberg is not allowed in because they don't allow shellfish (or the pig next to him). Hermes tells the stockholders of Planet Express that the company is on the verge of bankruptcy, while Fry moves on to a Cryogenic Support Group which also offers free food (and bars Zoidberg from coming in, as Zoidberg has never been cryogenically frozen). There, Fry meets Steve Castle (who is never referred to by his name — see Trivia), a 1980s stockbroker who had himself frozen to await a cure for his terminal boneitis. Feeling compassion for his contemporary, Fry invites him to work for Planet Express, and they return to the stockholder meeting where Hattie McDoogal is demanding to nominate a new CEO because the Professor has insulted her cat. Leela, Bender, Amy, Hermes and the Professor (10,000 shares each) vote for Farnsworth, while Fry (10,000 shares), Scruffy (40,000 shares) and Hattie (1 share) vote for Castle, making him the new CEO of Planet Express. Act II: "I am proud to be the shepherd of this herd of sharks." Castle is turning Planet Express upside down and blaming everything on the old management, that is, the Professor. He makes Fry his vice-chairman and intends to bring Planet Express right to the top of the delivery business, which means that they have to attack Mom's Friendly Delivery Company. Of course, Mom is not amused to learn this. Castle follows his secret of success, which is that everything is about appearances, and gives Planet Express a completely new look and a completely new image. Zoidberg is not happy about the company's development, and sells all his shares to Castle for a sandwich. Mom is getting agitated about the new "Delivery Kings" that business magazines write about so much (even if PlanEx hasn't made even one single delivery since the takeover), and has a private meeting with Castle after they have a talk at Elzar's Fine Cuisine. As the crew is voicing their concerns about the way Castle is handling business, and Fry is defending him, Castle tells them they are all fired and that Mom is going to take over Planet Express. Act III: "My only regret is... that I have... boneitis." Fry insists that he is innocent of the selling of the company, but no one listens to him. He decides to block the takeover, and goes to the Intergalactic Stock Exchange in Earth's orbit where the takeover is to take place in the Business Centre. All of PlanEx's stockholders are there, plus Mom, her three sons and Castle. Both companies have to agree to the takeover, and even though all of the Planet Express crew vote against it, it turns out that the shares Zoidberg sold to Castle gave him majority control. The takeover is approved, and MomCorp now wants to buy all the shares it doesn't own at the price of $107 per share, which makes every remaining stockholder a millionaire. Fry asks Castle if he will not stop the takeover, but he refuses because he's an 80's guy. Suddenly, every bone in Castle's body starts to snap and bend—it turns out that he was so busy being an 80's guy that he forgot to get the cure for his boneitis—and his body rapidly contorts itself through several bone-breaking poses before he dies. After Castle's death, Fry gains control of his shares and makes a speech about how what really counts is friendship, which is more important than money - and as he makes the speech the value of the shares gradually crashes down until it reaches $0.03 per share. The crew tries to stop him doing the right thing, but it is too late - the shares of Planet Express are, once again, worthless and Fry rejects the takeover, as they have nothing left to gain from it. The crew grudgingly goes back to work. 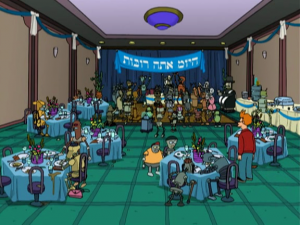 At the Bot-Mitzvah, the banner reads "היום אתה רובוט" (hayom attah robot) with two misspellings, which translates to "today, you are a robot". That Guy and Fry get their new suits at Giorgio Amonster. Jackie Anderson and the Pawnbroker are at the ape fight. The man from the 80's is listed in the script as "Steve Castle", but is only ever referred to in dialog as "that guy". Had the sale of Planet Express gone ahead as planned, That Guy would have made around $11.16m, Scruffy would have made $4.28m, Fry, Leela, Bender, Hermes, Amy and the Professor would each earn $1.07m, Hattie would get $107, and Zoidberg would be left with the rotting sandwich he swapped his shares for. Apparently, Decapodians can tolerate expired food more than humans. When the professor hands Steve Castle his business/escape plans, he notes that he keeps it next to his heart. If you look closely at the open drawer, there's a partial picture of an actual heart in a jar there. The robot rabbi says " no shellfish" and does not let Zoidberg in the Bot mitsvah, then the pig says " tell me about it". If a Jewish person keeps Kosher, they cannot eat any shellfish or pork, this is a reference to that, Zoidberg being the shellfish, the pig being the pork. Scruffy: Now hold on there. Scruffy votes his forty thousand shares for the mysterious stranger. Leela: Forty thousand? How come you have four times as much stock as the rest of us? Leela: Oh my god! I'm a millionaire! Suddenly I have an opinion on the capital gains tax! That Guy: There are two kinds of people. Sheep and sharks. Anyone who is a sheep is fired. Who is a sheep? That Guy: Gutsy question, you're a shark. Amy: Look, everyone wants to be like Germany, but do we really have the pure strength of will? Professor: I'll ruin you like I ruined this company! That Guy: [Checking his new business suit.] That's what I call a hostile makeover! Professor: This isn't a business. I've always thought of it more of a source of cheap labour, like a family. That Guy: [on screen] Everyone's fired and we're out of business. That Guy: [on screen] I'm gonna sell Planet Express to Mom so she can gut the company and eliminate us as competitors. Hermes: The shares were worthless, and he kept asking for toilet paper! The PlanEx logo in the commercial looks a lot like the FedEx logo. The PlanEx commercial is a parody of that of Apple Computers in 1984. And the fact that the crew hates the commercial is a reference to Apple Computers' own opinion of the commercial which only aired once; during the Super Bowl. During the voting for the future of Planet Express--with the option of two buttons, one in favour, the other opposed--Mom's son Igner is confused and inexplicably registers a vote for "Pat Buchanan", in reference to the infamous Florida voting controversy of the 2000 U.S. Presidential election. With everyone staring angrily at Igner, he says in his defence "the ballot was confusing," thus making fun of the election even more. In the scene where "That Guy" and Fry are watching an ape fight, Calculon is struck by an oversize tricycle hurled from the ring. His angry "Get your stinkin' trike off me, you damn dirty ape!" is an obvious parody of George Taylor's line "Take your stinking paws off me, you damned dirty ape!" from the 1968 film Planet of the Apes. The stock exchange space station shows stock abbreviations including RUN and DMC (in reference to hip-hop group Run-D.M.C. ), KIRK, GORN, and Q (Star Trek references), FOX (20th Century Fox, the producer of Futurama), and MG, FOX showing a loss of 61 points. OSX and WIN also appears (references to Mac OS X and Microsoft Windows respectively, interestingly, OSX have gone up, while WIN have gone down). In addition, e^(i*pi) is shown as being down 1 point, in reference to the mathematical equation e^(i*pi) = -1. The station's appearance, as well as a waltz playing on the soundtrack, is a reference to a similar scene in the film 2001: A Space Odyssey. The exchange's giant-image holographic public-address system ("I am Jor-El, Master of Scheduling!") is a reference to a scene in the 1978 Superman film, featuring a character named Jor-El (who is, in fact, Superman's father, though the holographic face in this episode does not resemble the Jor-El of DC Comics), and a tribunal of larger-than-life projected faces. "That Guy" had a Miami Vice lunchbox. A stock broker robot orders to "Sell one hundred soylent beans! ", referring to the movie Soylent Green. That Guy says that this company (Planet Express) is gonna get up and stay up like Cyndi Lauper which is a reference to Lauper's great popularity in the 80's, That Guy's time span, and decline after the 90's. When That Guy is about to sell Planet Express he says "It's Hammertime" a catchphrase inspired by popular 90's musician, MC Hammer. Amy says "Look, everyone wants to be like Germany, but do we really have the pure strength of will? ", a reference to the 1934 Nazi propaganda film Triumph of the Will. The shop where Fry and That Guy buy their tuxeedos is called Giorgio Armonster, a reference to fine clothes and perfume shop Giorgio Armani. Scruffy reads National Pornographic, which looks a lot like a National Geographic publication. The name "National Pornographic" is also the title of a magazine in the Simpsons comic The Krusty Book. The businessman from the 1980s is loosely based on the character of Gordon Gekko from the movie Wall Street. In turn, Gekko was modelled after real world corporate raider Ivan Boesky. That Guy's real name in the scripts was Steve Castle. That Guy's plan to boost PlanEx's "image" in order to sell the worthless company that does nothing's stocks off at exorbitant prices is a direct satire of the Enron scandal. The banner written in Hebrew at the Bot-Mitzvah is spelled incorrectly. It reads "היומ אתה רובות", when it should be "היום אתה רובוט" (hayom attah robot, "today you are a robot"). It could be a reference to a Bat-Mitzvah which is a ceremony girls have at the age of 12, the word "בת" (Bat) means girl, or daughter. Since Bat and Bot are similar this makes sense. Although Zoidberg trades all his Planet Express shares for a sandwich, he is seen with a vote remote and casts a 'No' vote for Mom's hostile takeover. Zoidberg could be allowed to vote, but would have no impact since he sold all of his shares. Fry does not cast a vote declining the offer to sell to Mom during the initial vote. Fry could have given his proxy to Zoidberg, which explains why Zoidberg is seen voting. When the crew goes into Fry's office, the picture of That Guy hanging on the wall doesn't have a pocket handkerchief in his jacket pocket, but, when it is shown later in the scene, it does. Also, when the crew goes into the office, there are camera views both behind Fry (from his perspective) and looking onto him (the crew's perspective). In one of the cuts from one camera to another, it shows Fry's hair slicked back, then in his usual spiked-up style, and then again slicked back. According to Hermes, when the value of the shares drops to $0.03 it is "worth less than when it was worthless." Zoidberg had 51% of all shares, more than 100,001 (Fry, Leela, Bender, Hermes, Amy and the Professor's 10,000 each, Scruffy's 40,000 and Hattie's one). At 3 cents per share, that means he had more than $3,000 which Hermes just gave away as toilet paper. It seems out of character for Hermes to lose track of how much money he is actually giving away. However, even though it cost a substantial amount of money in total, it could be the case that actual toilet paper would have cost more per square inch than the stocks. Figuring this out is definitely characteristic of Hermes. It would seem as though Hermes was indicating that Zoidberg wouldn't need toilet paper from Hermes, as Zoidberg could instead use the stocks he owned for the purpose. This strangely does not provide any clue as to why Zoidberg held so much stock in the company since he constantly has no money and believes that $300 is a large amount, while the stocks were worth at least $4000 (as the stock was worth more than $0.03 before). When Fry pushes the launch button to get away from the crew the rocket under the chair bends right before it hits the floor. This page was last edited on 2 January 2018, at 15:25.